"These movements tell us that we need to have a critical discussion on women's rights, equality, and the power dynamics of gender." Prime Minister Justin Trudeau took a moment to highlight the fight for women's rights and gender equality to international leaders on Tuesday. 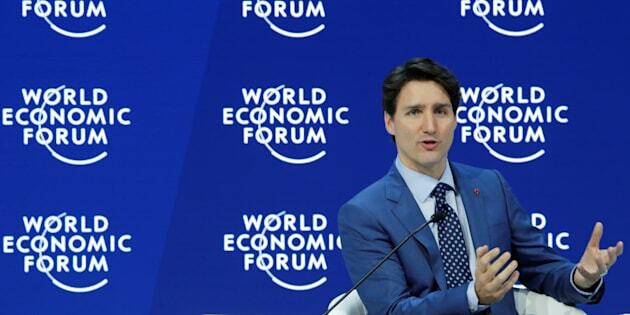 In his second appearance at the World Economic Forum in Davos, Switzerland as prime minister, Trudeau called sexual harassment in government and the workplace "unacceptable," mentioning the #MeToo and #TimesUp movements and international women's marches. "These movements tell us that we need to have a critical discussion on women's rights, equality, and the power dynamics of gender," Trudeau said in the speech. "As leaders, we need to recognize and to act to show that truly, time is up." The prime minister called for a "well-understood, established process" to file workplace harassment, and for leaders to take complaints seriously. "As women speak up, it is our responsibility to listen, and more importantly, to believe," he said. He also urged leaders to hire, promote, and retain more women, citing a study that said narrowing the gender gap in Canada could add $150 billion to the economy by 2026. Canada will host the G7 leaders' summit in June. The benefits of gender equality and the advancement of women in the workplace is expected to be one of the themes to be discussed there. Trudeau's efforts to attract investment in Canada come amid an uncertain future for the North American Free Trade Agreement and the country's special access to the U.S. market. The trade pact's sixth round of negotiations are currently being held in Montreal.